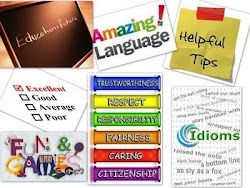 English Teaching Zone: English is a crazy language questionnaire! English is a crazy language questionnaire! What about starting your lesson with a discussion about the English language and its pecularities? The text on picture above is a nice way to show it! 1) What do you like the most about English? 2) What is the most difficult thing to learn? 3) What's your favorite accent? 4) What is the most difficult word to spell? 5) What's your favorite word in English? 6) Why is learning English important to you? 7) Which example from the text above called your attention? 8) Besides coming to class, what else do you do to practice your English? 9) What are you particularly interested in learning about English this year? 10) What advice would you give for someone who is starting to learn English? While English is indeed a crazy language some words are more important to people than others. I also have favorite words and since I wanted to better know myself and others, I joined favoritewords.com - take a look, you might like that site. Conundrums to warm up or wrap up your lessons!